Francis Gordon Lennox was born 31 August 1912 in Melbourne, Australia. He was educated at Mordialloc High School and later at Melbourne Technical College (1929-31) on a Senior Technical Scholarship. He obtained Diplomas in Applied Organic and Inorganic Chemistry, with Chemistry Prizes in 1st and 3rd years. He was awarded a University Free Place; obtained a BSc with 1st class Honours in Biochemistry and 2nd class Honours in Bacteriology and Chemistry, from the University of Melbourne in 1933; and an MSc in 1934 with Final Honours Exhibition in Biochemistry. He worked as a Chemist at the Munitions Supply Laboratories, Maribyrnong, Victoria from 1934 to 1936 when he moved to Canberra to join the CSIR Division of Economic Entomology. On his request, he transferred to the Division of Industrial Chemistry, Melbourne in October, 1940 to lead the new Leather and Fellmongery Section. When I last saw you I was optimistic about the prospects of doing useful biochemical work in Canberra … In the meantime, the war has almost completely upset our original ideas and now, instead of working together, we appear to be diverging into independent channels. My current research is hardly the type of work that one should be doing in wartime if there are more urgent problems waiting to be investigated. Knowing that the Division of Industrial Chemistry is in the process of formation I felt that you should be acquainted with my position. You may feel that there is some problem of national importance that a biochemist working in the new Division could usefully investigate. He then went on to suggest that he might investigate biochemical and bacteriological problems of industrial fermentation processes, including the production of power alcohol as a substitute for fuel, from grain and other starchy materials. The Leather and Fellmongery Section changed its name to the Biochemistry Section in 1943. It became the Biochemistry Unit of the CSIRO Wool Textile Research Laboratories in 1949, with Lennox as its Head. These Units were a new group of laboratories established to carry out research into all aspects of wool science and wool utilisation. Its sister units were Textile Physics, located at Ryde, NSW, and Textile Industry, located at Geelong. In 1959, CSIRO decided to confer Divisional status on all three Units of the CSIRO Wool Textile Research laboratories. Originally it was proposed that the Parkville Laboratory would be called the Division of Textile Chemistry but Gordon Lennox as Foundation Chief, argued for a broader title, the Division of Protein Chemistry, which was accepted. In retrospect, this decision probably had a major influence on the future direction of the Division. If the name ‘Textile Chemistry’ had been adopted it is unlikely that the Division would have made its seminal research contributions to the fields of collagen structure, plant proteins, viral proteins, veterinary vaccines, drug development, protein engineering and receptor biology. Gordon Lennox was the author or joint author of some 62 scientific research papers and reviews in the fields of biochemistry, insect physiology and toxicology, enzymology, photo-chemistry of proteins, and manufacture and utilisation of wool textiles and leather. Lennox was leader of the Section and Unit for 19 years and then Chief of Division for a further 14 years, transferring in 1973 to London as Counsellor (Scientific) at the Australian High Commission in London at the request of the Australian Department of Science. An emotional farewell dinner was held at The Old Melbourne Motor Inn on the 23rd August 1973 to honour Gordon and his wife, Fran. At the completion of his term in 1976 they returned to Melbourne. He was an outstanding Chief, greatly loved by his staff. He expected and encouraged all scientists to attend the weekly laboratory seminars to keep abreast of the work going on in the Division. He also drafted a fortnightly newsletter, by visiting every scientist’s laboratory to discuss science. 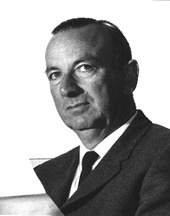 The newsletter was initiated by William Gordon Crewther in 1954 to keep Lennox informed of the laboratories progress during Lennox’s 5-month tour of Europe and the USA to generate interest in the upcoming International Wool Textile Research Conference to be held in Melbourne and to invite notable scientists to attend. On his return Lennox continued the newsletter, which was sent to all staff of the Division. The hundred years during which the Chemical Society has existed constitute the most eventful century in known history, and it may be said with justice that chemistry has played no small part in making it so. In celebrating the 100th anniversary of the foundation of the Society the present Fellows do honour to the great chemists of the past, and at the same time turn their thoughts to the prospects of an unknown future. At such a moment they are especially glad to welcome their colleagues from overseas, and to feel that men of science all over the world are united in the pursuit of knowledge which is the primary object of the Society. Another highlight was his co-hosting the first International Wool Textile Research Conference in 1955. The 141 scientific papers delivered included contributions by international personalities such as the Nobel Prize winners, Fred Sanger, AJP Martin and RLM Synge, and the acknowledged authorities on wool research, namely Professors JB Speakman and WT Astbury, both from Leeds University. A highlight of the conference was a talk by Professor Robert B Corey in which he described the work, carried out by Linus Pauling and himself, which led to the discovery of the Î±-helix and the Î²-pleated sheet structures of the proteins. Lennox ran the Division like a family and used the weekly seminar session to address the staff on relevant issues. When overseas, staff wrote frequently to the Chief to keep him informed of their progress. These letters were duly read to the assembled Division at the regular weekly scientific meetings held in the laboratory. These letters were the source of much information, both scientific and humorous. Lennox was a man of transparent honesty and integrity, who believed that science had an important part to play in bettering the well-being of all Australians and that even though a scientific project might not yield an immediate commercial benefit, good science properly conducted and recorded always yields a profit. Lennox served as representative of the Faculty of Science on the Council of Monash University from 1964 to 1973. He was Deputy Chancellor, Monash University from 1968 to 1973, and Chairman, Schools Board for Pharmacy and Biological Sciences, Victorian Institute of Colleges, Melbourne from 1969 to 1973. He also served on the Warrnambool Institute of Advanced Education Course Advisory Committee in Applied Science for several years before and after joining the High Commission in London. He was Chairman of the Bendigo College of Advanced Education Course Advisory Committee from 1979 to 1981. He took an active interest in the Australian & New Zealand Association for the Advancement of Science (ANZAAS) and he and his wife Fran met HG Wells at the 1939 Congress in Canberra. Wells gave a paper on the role of English in the development of the world mind. We were badly positioned and all we entertained were cows in a paddock downwind. In 1980, he and his wife established the ‘Australian Musicians’ Guild Violin Scholarship’ for competition annually among young violinists who are residents of Victoria and have not reached the age of 15 years by 1 July of the year of the award. One of the conditions of the award is that the recipient shall perform in public.